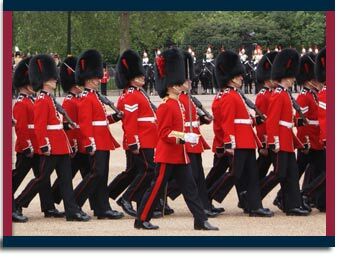 If you are planning or thinking about leaving the Coldstream Guards or have already have done so, then contact us today and we can give you advice and contact employers suitable for your skills and experience. Let us help you take the first steps to a new career. In the early years of the regiment they saw action in Flanders and the Monmouth Rebellion 1685, this was event was an attempt to overthrow King James II. Later they were also sent to fight in the American War of Independence and the Napoleonic Wars. In the Battle of Waterloo they saw action on the outskirts of Waterloo in the chateau of Hougoumont. In the Crimea War four Coldstream Guardsman received the ultimate award for bravery, the Victoria Cross when they got back home. The regiment in 1855 got its present name, The Coldstream Guards and from then on it has stayed the same and have since seen action in both World Wars, the First Gulf War and Afghanistan.